Show of hands who loves salmon as much as I do? All of you? I know, there can’t be a soul in the world who doesn’t love salmon. Well at least that’s what it’s like in my world. My mother recently bought a large quantity of salmon. If you have bought salmon in Nairobi, you know it is hella expensive. The kind of expensive that requires you to have sold your sisters kidney! Trust me, I have been tempted many a time. However, my mother being a farmer, and all her connections in the farmers world got us a whole lot of salmon for a cheap. I sometimes imagine farmers have their own mafia like underworld… Cross a farmer and you wake up with half a head of cabbage in your bed *eek* okay, okay i stop now! Back to the Salmon. I thought about making salmon en croute, as we all know that is like one of my favourite ways to eat salmon. But I wanted something simple and easy to make (cooking with a hangover). What is simpler than grilled salmon? The lime butter sauce was a kind of experiment. Salmon goes really well with oriental type sauces, that sweet and somewhat sour taste. I wanted something sharp for the salmon… Again the hangover was dictating this! 2 fillets of salmon, I had 2 very large pieces about 250g each. Start with patting the salmon with a paper towel until completely dry. Coat them with a little olive oil, salt and pepper. Heat a griddled pan over medium heat. If you are fortunate enough you can use an outdoor grill. Place the salmon fillets on the griddle and leave to cook, about 5-8 minutes each side. 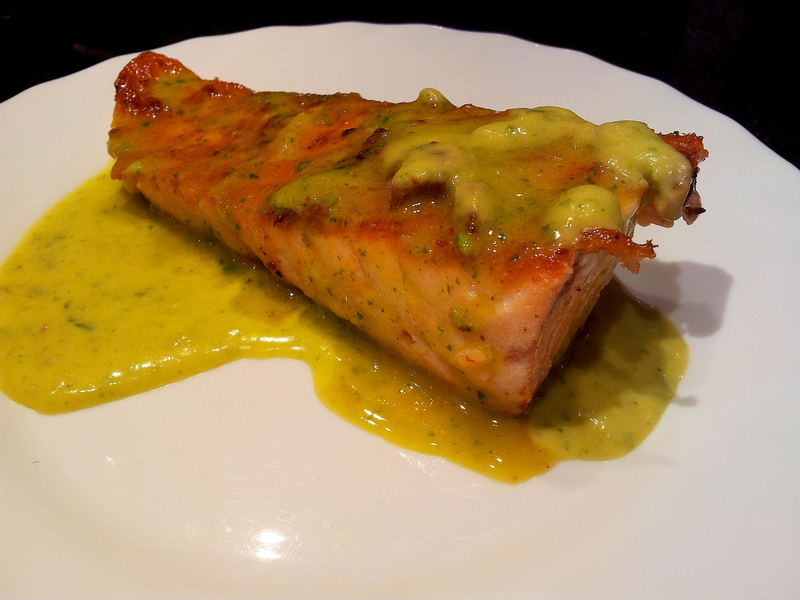 While the salmon is searing away, place the lime, garlic, coriander, salt and pepper in a blender. It is easier to use a mini blender. Blend for a minute before pouring in the melted butter in slow and steady stream. Taste and season appropriately. 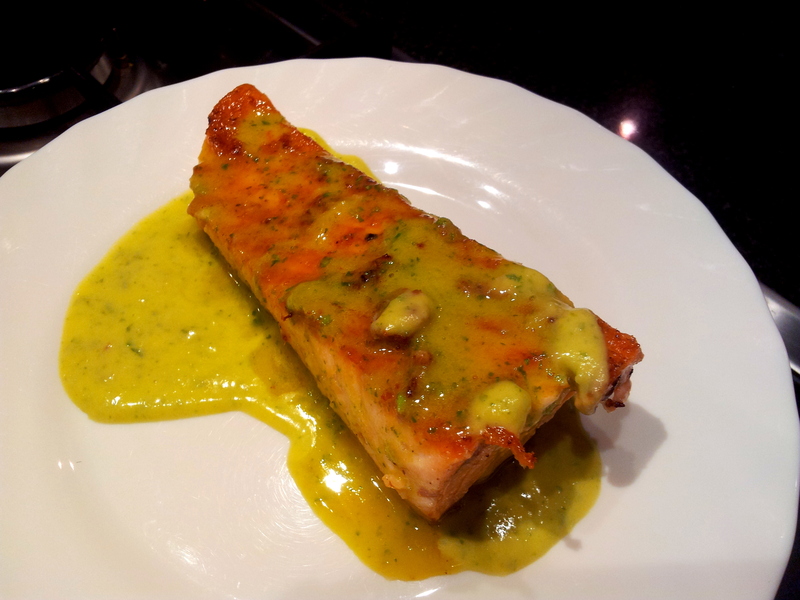 Remove the salmon form the griddle, plate up and pour over the lime butter sauce. Watch it melt over the salmon like umm… butter!